ALBUQUERQUE, N.M. (ANS – April 6, 2016) — People “liking” Joy Junction on social media usually do so because they have a concern for the homeless and hungry, and an appreciation for the help that community support allows us to give. However, all of our staff at Joy Junction have a very personal story, which greatly impacts the work we do for the needy. As the Founder and CEO of Joy Junction, I am no exception, and so I thought you may appreciate a “peek behind the scenes” at my life. It’s just over a year since I married Elma, the love of my life. She has quickly become an indispensable part of everything I do at Joy Junction, and we quickly realized that we are two hearts with one vision. We’re always together, where we’re in the community daily, heightening awareness of the plight faced by the homeless, and letting people know what they can do to make an impact on the issue by partnering with Joy Junction. While I could never have kept going for so many years without your prayers and support, God also knew I needed a partner. As He told Elma shortly after we met, we could do more for Him together than we could apart. We continue to see the truth of those words unfold daily. In addition to our work for Joy Junction in the community, Elma and I usually finish our work days off with a visit to the shelter. 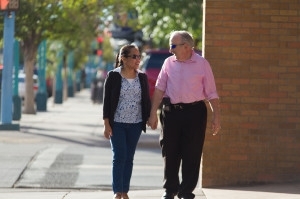 After all, that’s ultimately the reason why we spend countless hours every day crisscrossing the streets of Albuquerque going from one meeting to another. The time we spend at the shelter includes some joking and light hearted banter with the staff, and on other occasions a little interaction with our guests. As the months have gone by, they have come to increasingly love Elma. Who couldn’t? She’s as lovely inside as she is out. In addition, it’s an absolute joy to spend many Saturday evenings sharing God’s Word at Joy Junction, with Elma concluding my message as she shares a five to 10 minute sermonette rounding out what I have been sharing. In addition, she occasionally blesses all of us with a song. She has a great voice. Of course, while our guests only get to hear her sing a song once, I am treated to her renditions may time as I hear her practicing. However, the path to our getting married was not at all conventional, and while beautifully covered by local media the day after we got married, some of you may not be aware of our journey. So how did this whole adventure begin? I first met Elma “virtually” on www.eHarmony.com in early 2013, and then in person in Oct. 2013 during a quick trip to Israel. During that same visit, I also produced a number of stories from Israel, Bethlehem and the West Bank for the ASSIST News Service, for which I have been a correspondent for many years. (My academic training is in journalism, communication and intercultural education). Prior to that meeting, we had talked by phone and corresponded by email daily for a number of months. It quickly became obvious to Elma and I that we have much in common. A year back before Elma and I met on eHarmony, we had been praying that God would bring the right person into our lives. Not only as a husband and wife, but also as a ministry partner. We both learned ( after many years) to give God the full authority over our lives in finding that person. Doing so always works out best in the end, and Elma and I are ongoing testimonies of that fact. We are both Christians, and love to help the poor, hungry, marginalized and disenfranchised. What better choice for a life partner than that? We got engaged in Bethlehem, and returned to Tel Aviv a few days later. When it was time to leave Israel the following week, tears flowed. I realized that I was truly in love, and had met the woman with whom I wanted to spend the rest of my life. During the ensuing months we continued to talk daily, usually for between 90 minutes and two hours at a time. I spent more time with Elma on the phone than I had with anyone else in my life. I am so appreciative for a cheap Internet based telephone service I found which allowed us to talk for less than two cents a minute. Of course, that was all we could do. We couldn’t go out to see a movie or take a walk on the beach. However, that time we spent talking laid a great foundation for a strong relationship. Most married couples don’t spend that amount of time communicating, and when I would sometimes tell friends how long we we spent on the phone, they would look at me in amazement. We talked about every subject conceivable, including sharing what we imagined our lives together would be like in the years ahead. There was no made for TV “drama,” just an increase in the love and commitment we felt for each other. In Jan. 2014, I submitted a packet of information to the U.S. government to start the ball rolling for the K1 visa-also referred to as the 90 Day fiancé visa- upon which the reality show of the same name is based. While 90 Day Fiance not surprisingly focuses on the drama that occurs after the foreign fiancé arrives in the United States, in our case there was more intense internal emotional drama as we worked our way through the visa process and exposed much of our lives to the probing eyes of the United States government. In addition to tax returns, fingerprints, an FBI background check and proof of income, Elma and I also had to include as part of our application package a number of the emails that we had exchanged with each other. Finally, the packet was ready to be submitted. Now the waiting began. We next spent a few days together in Tel Aviv in March 2014, where we had a beautiful engagement dinner attended by Elma’s pastors and many members of her church. While technically the requirement for a K1 visa is that you have only have to meet once in person preceding the interview at the embassy, obviously more meetings are conducive to a healthy relationship. They’re also useful to help prove to routinely suspicious consular officials that the relationship is genuine. In July 2014, Elma returned to the Philippines to spend some time with her daughter. I joined her a few weeks later, and we started gathering additional documents still needed for the all important interview at the Embassy, for which we still yet didn’t have a date. As we waited and waited, it was an ongoing feeling of frustration and powerlessness. We couldn’t do anything other than let the wheels of the bureaucratic process run their course. And for me, typically a Type A personality, it was perhaps worse than for others. I would wake up day after day hoping that there would be some communication indicating progress. Elma encouraged me to be patient. I wasn’t. Finally, we found out that the U.S. Embassy in Manila was ready for us to schedule our appointment. We went on line, and saw that Jan. 29 2015 was available. After that, I recall, there was nothing open for at least a couple of months. We quickly locked in the date. The day loomed large in our minds. As it drew closer, neither Elma or I thought about much else. We were prayerfully prepared, but it was still a tense time. Finally the day arrived. Elma went by herself to the interview, as we didn’t think I was allowed to be there with her. Later on, I found that I could have accompanied her. The morning hours of Jan. 29 passed slowly for me, as I prayed and waited for Elma to come back and tell me how things had gone. Finally she arrived and said that things had gone well, but we still needed three more documents. Two of those we obtained the same day and sent to the embassy. Another one took a little longer, but about a couple of weeks later we heard from the embassy that they had everything they needed and would notify us of their decision. We were back to the waiting game again, and there was nothing else for us to do other than wait. I so appreciated our good friends in Davao, who encouraged us during this time and for many months prior. The Edge radio station manager Jay Bringas, Pastor Michael Thompson and Jeremiah Gubat, you will always have a special place in our hearts. A couple of weeks or so after, that long anticipated email arrived from the embassy. Elma had been granted the K1 visa. I started crying-tears of happiness. Our long wait was over. As I reflect on the last three years, though, it has been the most exciting time in my life. God used the eHarmony computers to introduce us to each other, and that resulted in me getting to know the woman who would become the love of my life and very soon my wife. Meeting Jesus in 1976 changed my life forever. Now 40 years later, my journey with the most amazing woman I have ever met in my life is everything I ever thought it could be and more. I wake up each morning thankful for the blessings that God has given me, looking forward to what lies ahead as I go about that day’s activities with Elma at my side. We are truly (thanks to God’s provision and uniting), two hearts with one vision for the homeless, poor and hungry. Your prayers and support are so appreciated as we continue together with the work that God has for us. Photo captions: 1) The happy couple on their wedding day. 2) Jeremy and Elma Reynalds. Note: If you would like to help support the ASSIST News Service, please go to www.assistnews.net and click on the DONATE button to make you tax-deductible gift (in the US), which will help us continue to bring you these important stories. If you prefer a check, just make it out to ASSIST and mail it to PO Box 609, Lake Forest, CA 92609, USA.